Welcome to the Houston Illini Club! 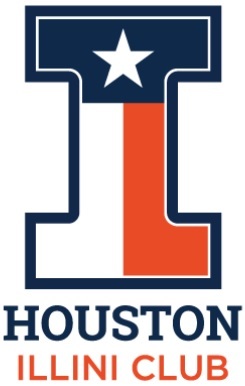 As one of over 3,500 University of Illinois graduates (UIUC, UIC or UIS) that resides in the Houston area you are invited to join the Houston Illini Club! You will enjoy the company of fellow Illini and exclusive event savings. Additionally, through our club's annual scholarship and participation in local college fairs you will help to improve the University of Illinois' reputation within the Houston area. We meet throughout the year, and have wide ranging fun events for you, your family and guests. We waive membership dues to Illini who graduated within the past three years and those who graduated 50+ years ago. Our membership year is from July 1st through June 30th, where dues paid after April 1st credit for membership through June 30 of the following year. The default option is for you to pay your dues ($20 single or $25 family) by credit card via selecting an option shown below. Note: If you prefer to send in your dues via check instead of credit card then mail your check (noting the UIUC alum's name and graduation year) to UIAC of Houston, P.O. Box 542314, Houston, TX 77254. Please allow one month for your membership to be processed as nearly all of the club's memberships are processed via our preferred credit card payment option, which simplifies and streamlines the administration of club memberships while maximizing members' convenience. Description: Single Illinois alumni who join or renew are provided membership through June of the following year. Description: Married Illinois alumni who join or renew are provided membership through June of the following year. Description: The club waives dues through June of the following year for graduates of the past three years, and for those who graduated 50+ years ago.